The water is calm and crystal clear, it’s another picturesque morning in South Maui. Visitors have breakfast, grab their coffee, workout, and get the family ready for a day at the beach. What they don’t notice is the wind line slowly creeping in, they grab their snorkel gear, rent some paddleboards, and jump in the water, unaware of what’s about to happen. The wind hits the beach, pushing snorkelers further out into deeper water and paddleboarders are now stuck in the wind, unable to paddle back to shore. That’s when the Maui Fire Department is called. Millions of visitors and locals visit Hawaiʻi beaches each year, a study in August 2016 surveyed 1,275 visitors to Oʻahu, Maui and/or Kauaʻi, and found that 98% of the visitors went to the beach on their vacation. On Maui, 96.7% of those surveyed said they visited a Maui beach and almost 50% said they visited the beach four or more times. 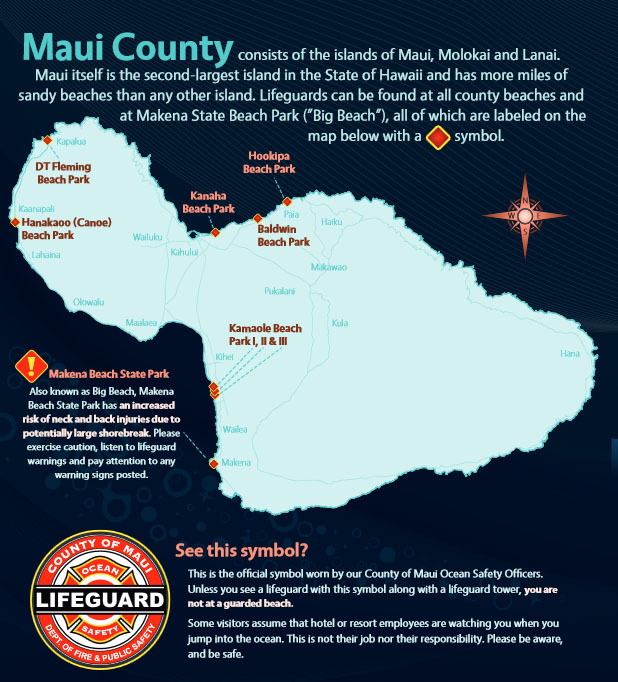 “These numbers tell me we have to make sure visitors are safe on the beach,” said Colin Yamomoto, battalion chief of the Maui Fire Department’s ocean safety division. 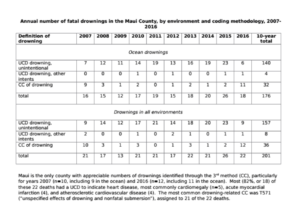 New data released by State epidemiologist Dan Galanis shows that from 2007 – 2016, there were 873 drownings in Hawaiian waters, 690 or 79% were ocean related. Since Jan. 1, 2017 there have been 15 ocean related deaths and one fresh water cave death in Maui County. 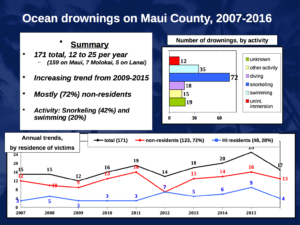 The new data shows that from 2007-2016 there have been 176 ocean drownings in Maui County, that’s 13 more than Hawaiʻi and Kauaʻi County combined. On top of that, 25 more deaths occurred in swimming pools, fresh water and/or other bodies of water bringing Maui County’s total number to 201 in that time frame. This week alone there were three incidents that occurred on South Maui beaches. Two men were rushed to the hospital in critical condition within a span of two days, a 55-year-old man was snorkeling at Keawakapu and the other man was swimming at Ulua Beach, and on Aug. 24, a 52-year-old female from Canada died while snorkeling at Keawakapu beach. Drownings are the leading cause of death for visitors to Hawaiʻi. 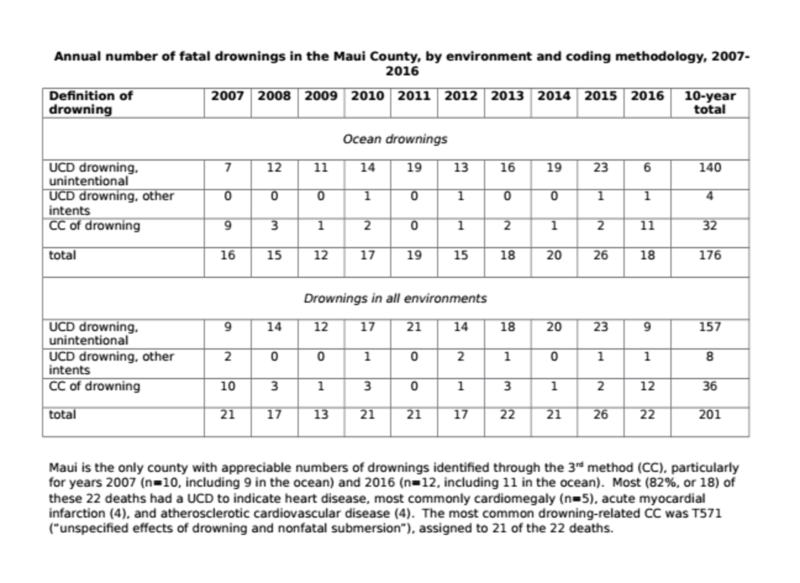 With the new data, Maui now averages 12-25 drownings a year with 171 deaths categorized as an “underlying cause of death.” (see below). Of those deaths the study showed that 72% of ocean related deaths happened to visitors, with 72 of those deaths caused by drowning. *The numbers are skewed in 2007 and 2016. There were 10 “contributing causes” in 2007, including nine in the ocean and in 2016, 12 were CC, including 11 in the ocean. Most (82%, of 18) of the 22 deaths had a UCD to indicate heart disease. The most common drowning-related CC was “unspecified effects of drowning and nonfatal submersion,” assigned to 21 of the 22 deaths. Therefore, of the 176 ocean-related deaths on Maui, five were categorized differently than other counties. Some visitors can see the wind line coming in, and some hotel beach crews will inform tourists that the wind is coming in and to use caution by the rocks. Some beach crews won’t let you rent out paddleboards, but some do, and that’s when rescues take place. Chief Yamamoto says he wants his captains to start asking near-death victims and families where they received their equipment, if they were provided a safety briefing, or if they were offered a personal flotation device. “Those things are very important,” he said. He specifically credits Hale Huakai, operated by Kā‘anapali Beach Hotel and Iokepa Naeole, who manages their activity/beach business based on four principles: KBH Hospitality, Natural History, Cultural History and Ocean Safety. “If all beach rental companies were to adhere to these principles, our visitors would be safer and emergency crews would have fewer responses to visitors getting into trouble due to surf, wind, or their physical limitations and knowledge of ocean conditions. We believe Hale Huakai is the gold standard other beach rental companies should strive to imitate,” Chief Yamamoto said. He tells us that the most injuries occur due to shorebreaks and most rescues are from rip currents and the wind taking people out to sea. He explains that there are different types of rip currents, and that there are certain popular visitor spots on Maui that have strong ones. On Feb. 1, 2017, three men had to be saved from Nāpili Bay due to a strong rip current. Chief Yamamoto explains that the north side at Nāpili Bay has a rip current. There have been five rescues so far in 2017 at that location, four were visitors, and one ended in a fatality on June 18. The water surrounding Hawai‘i is different than in the mainland, in fact, there’s a disagreement among lifeguards on how to handle rip currents. The United States Lifesaving Association recommends ‘break the grip of the rip’ and swim parallel to shore. However, BC Yamamoto explains that depending on the surf and your swimming ability, if you ‘break the grip of the rip,’ it might take you into the surf zone. “You become so exhausted from breaking the grip that (depending on your swimming ability) you’re going to drown. To survive, let the current take you, and I know that can seem hard because all you want to do is get back to shore and you’re being pushed further and further away from it, but remain calm, let the current take you, and signal for help, try and float,” he said. Between 2009 and 2012, the most spinal injuries occurred at Maui’s Mākena State Park or “Big Beach,” which topped all other beaches in the state with 16 spinal cord injuries. “It’s not the really big days at Mākena, it’s the medium to small days where we see people getting hurt,” BC Yamamoto explains. When a swell rolls through, Mākena is a popular bodysurfing and bodyboarding spot for locals, however, the shorebreak can be extremely dangerous. On April 23, 2016, MFD responded to four water related accidents that required medical attention by ocean safety and fire personnel. One of the men, a 67-year-old male from Oregon, was transported in critical condition after he was knocked down by a wave in the shorebreak. Although Mākena led the state in spinal cord injuries, only one fatality has occurred at the beach since 2009. There was one incident in 2014, when a visitor was bodysurfing and knocked unconscious by a massive wave. The woman shattered two vertebrae and rushed to the hospital where she was kept on life support for almost a week, until she succumbed to her injuries. “According to USLA, the chances of drowning at a lifeguarded beach is 1 in 18 million,” said Chief Yamamoto. One Maui beach in particular was noted in Galanis’ updated report, Puʻu Kekaʻa, known as “Black Rock” in Kāʻanapali. 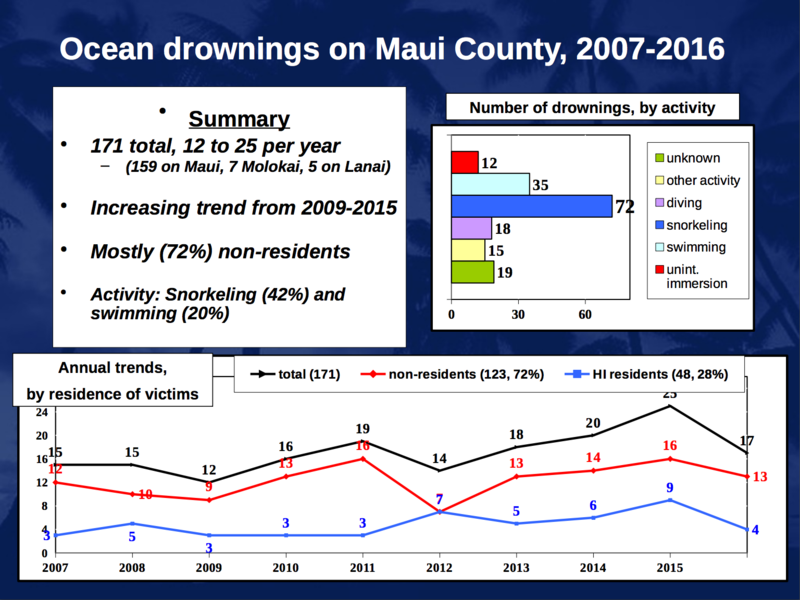 The chart showed that 21 drownings occurred at Puʻu Kekaʻa between 2007-2016, and 17 of them happened since 2011. The graph showed 20 of the deaths were non-residents and 17 or 81% of the victims were from the mainland. Fourteen of those deaths occurred while snorkeling, 86% of the victims were male, 76% were over 40 years old, and 43% of the victims had heart disease. Most days at Puʻu Kekaʻa are calm, with barely any wind, it’s a short swim to the rock, and it’s close to shore with many people around. So why are so many people drowning here over any other location? He explains that Puʻu Kekaʻa is known as a leina, meaning to spring, leap, or bound. According to the Hawaiian dictionary the word leina also means “leap of the gods.” A leina is a sacred place on every island where, after death, spirits would jump into the next world. Chief Yamamoto says that because Puʻu Kekaʻa is sacred we should call it by it’s Hawaiian name. He also explains that many kūpuna he has spoken with say no matter how many times the spot is blessed it will not make the spot safe due to its sacredness and maybe its disrespect to that area due to the many people that jump off it every day. In our “Ask the Mayor” column in 2014, one person asked Mayor Arakawa why there weren’t any lifeguards at Puʻu Kekaʻa. The mayor explained that Puʻu Kekaʻa is a non-county beach, therefore there are no county lifeguards and that the spot is privately owned above the high water mark on the shore and managed by the state ocean-side of the high water mark. For years state lawmakers and ocean safety crews have been proposing a safety video for Hawaiʻi-bound flights that inform and educate visitors on the dangers that have taken so many visitor lives. In 2013, the Hawaiʻi Senate urged the Hawaiʻi Tourism Authority to work with airlines and hotels to promote a safety video for incoming flights and visitor channels. However, the fear was that a safety video would scare tourists away. Until visitors are more informed on the dangers, one thing Chief Yamamoto has worked hard to enforce is the rescue tube initiative. The tubes are available to the public around the clock to stabilize swimmers in distress while they either wait for rescue by lifeguards, or find their way to shore. As of posting, there are now 40 rescue tubes along South Maui beaches from Kalama to Kamaʻole and seven in Hāna. He says he hopes rescue tubes will be installed at more dangerous locations like Nākālalele Blowhole and Olivine Pools. On July 29, 2017, a 48-year-old male from Canada died after being swept into the ocean near Nākālele Blowhole, witnesses say the victim was swimming and staying afloat, but at some point became unresponsive. There have been six incidents reported at “Olivine Pools” this year. In one of the incidents, two men and two women visitors were standing near the water’s edge taking photos when a wave broke over the rock and knocked the two men into the water. One of the men was recovered by Air 1, the other man was never found. Witnesses reported seeing the man in the water but lost sight of him. 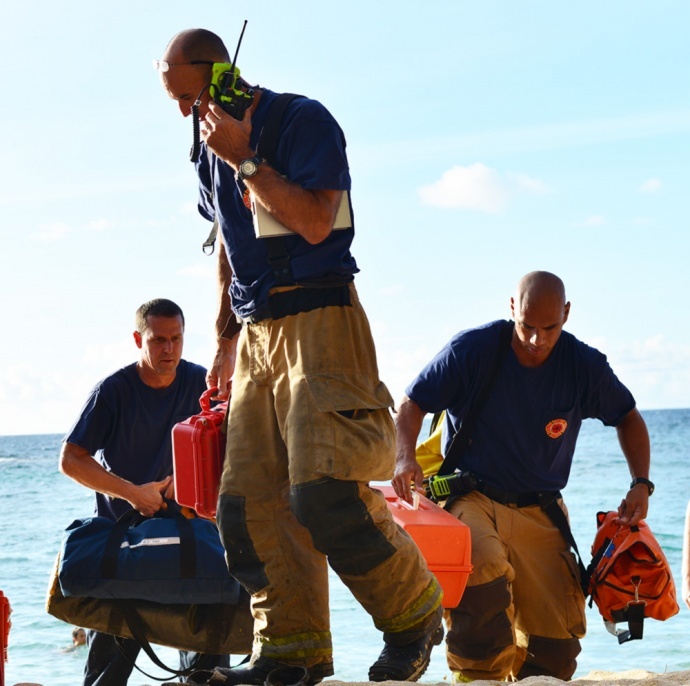 MFD, US Coast Guard Station Maui and Coast Guard Sector Honolulu conducted an extensive three-day search for the man but were unable to locate him. “A person can throw the device in so the victim can stay afloat until help arrives,” he said. It’s worth noting that these “off-the-beaten path” locations take longer for rescuers to arrive. The ocean isn’t the only body of water that tourists and locals need to be cautious of. As of Aug. 30, Yamamoto says there has been 15 mountain related rescues where 911 was activated. “The rule of thumb is, if the mountain is cloudy or dark, don’t go in the mountain,” he said. He shows a video of the speed and power of a flash flood at a popular visitor spot. Recently, on Aug. 21, three siblings from New Jersey were airlifted out of “Bamboo Forest” after the stream rose rapidly and were unable to cross. A month earlier, on July 19, firefighters were called to Bamboo Forest after a man slipped down the trail, a visitor told Maui Now that she went hiking earlier that day and observed flash flood conditions. On Dec. 11, 2016, two visitors were airlifted from “Commando Trail” after becoming stranded by high stream water. “We have an obligation to make sure the visitors we attract to Hawaiʻi go home safely,” Chief Yamamoto ended. In fact, BC Yamamoto said he’s working with the Maui Visitors Bureau to give a presentation on safety for visitors. 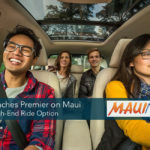 In a collaboration which will involve Haleakalā National Park, DLNR State Parks, Maui Police Department, and an organization that was formed to educate visitors about driving the Road to Hāna, and more, 10 people will present safety information to various hotel staff members across Maui. “If we can educate those people, they can assist us in providing this safety information to the visitors,” he said. 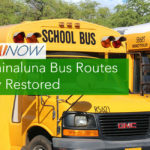 The presentations are scheduled for Nov. 29 at The Grand Wailea, from 8 a.m. until noon and Dec. 6, at the Sheraton Maui. For more ocean safety information, click here. For more information on flash floods, click here.